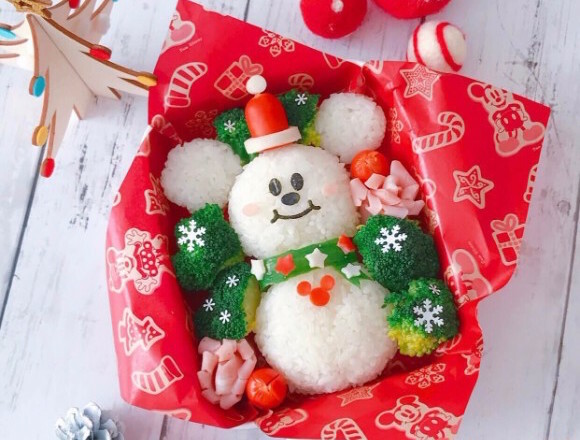 Kaori’s easy recipe – Learn how to make a “Snow Mickey Daruma Onigiri”! 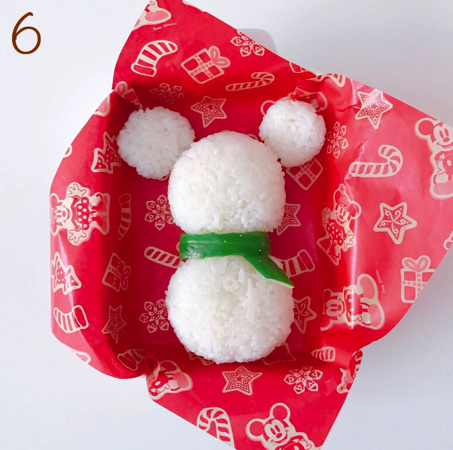 2: Shape the rice into a snow Mickey daruma. This recipe makes enough for a party with 2-3 children. Rice quantity: Face→70ｇ Body→80ｇ Ears→15ｇ. You can make them small enough to fit into a bento box or go for big ones. 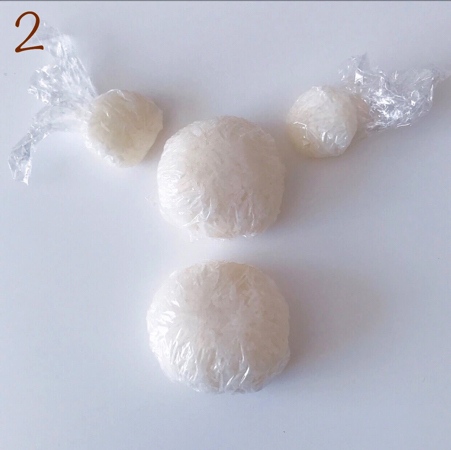 Wrap the rice into round balls and leave to cool on the side. 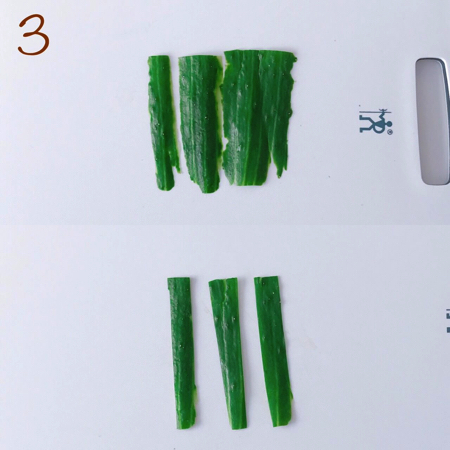 3: Thinly slice the cucumber or use a peeler to cut off the skin, making sure to keep the slices big and the same size. These will be used for Mickey’s scarf. 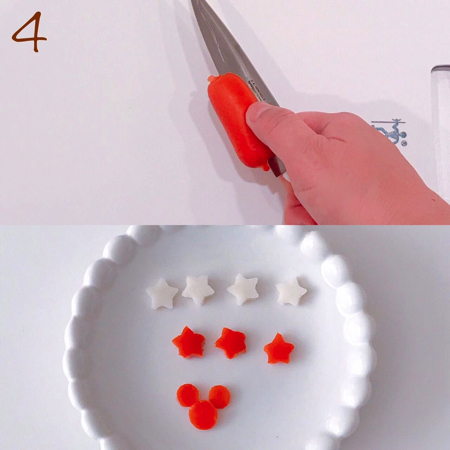 4: As before, slice the red wieners thinly and cut them into decorations for the scarf, like stars, and a Mickey head for the chest. Slice the kamaboko into stars too for the scarf. 5: Make a Christmas hat by slicing a red wiener in half and cutting the chikuwa to make the bottom part of the hat. 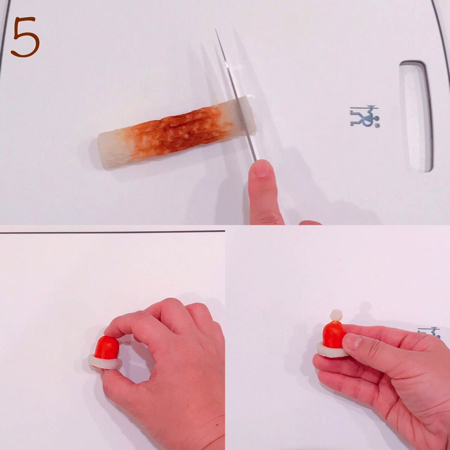 For the hat’s bobble, cut kamaboko into a sphere and fix with fried pasta. 6: Take out a container and decorate it with Christmas paper (the paper used in the picture is from Daiso). 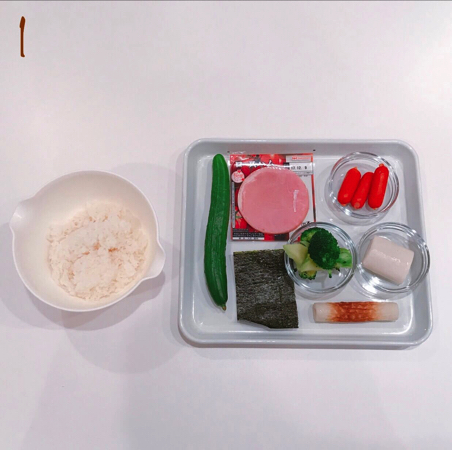 Make sure the rice has cooled down and set before arranging your mickey and adding the cucumber scarf. Once everything is arranged, add the stars onto the scarf and red wiener Mickey head onto his chest, the red wiener winter hat. Use the seaweed for the facial features and ham for the rosy cheeks. Complete by filling the sides with broccoli and ham. 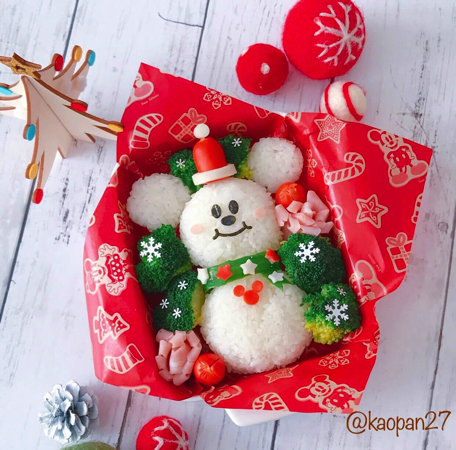 The hat and muffler can be used for whatever characters you like for your Christmas bento lunches and Christmas parties. Just one character food dish will make your table more exciting, even at small parties. Kaori’s articles showcase many different “character rice” dishes! There’s lots over on her Instagram page, so be sure to check it out.